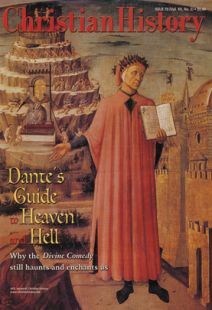 While in exile, Dante relied on wealthy friends for lodging and other support. In return, he offered his creations. In the letter excerpted below, he dedicates Paradiso to his friend Can Grande della Scala and attempts to tell the nobleman what the work is about. To the great and most victorious lord, Lord Can Grande della Scala, Vicar General of the Principate of the Holy Roman Emperor in the town of Verona and the municipality of Vicenza, his most devoted Dante Alighieri, Florentine in birth but not in manners, wishes him a happy life through long years, as well as a continuous increase in his glorious reputation. . . .
For me to be able to present what I am going to say, you must know that the sense of this work is not simple, rather it may be called polysemantic, that is, of many senses; the first sense is that which comes from the letter, the second is that which is signified by the letter. And the first is called the literal, the second allegorical or moral or anagogical. Which method of treatment, that it may be clearer, can be considered through these words: “When Israel went out of Egypt, the house of Jacob from a barbarous people, Judea was made his sanctuary, Israel his dominion” (Douay-Rheims, Ps. 113:1–2). If we look at it from the letter alone, it means to us the exit of the Children of Israel from Egypt at the time of Moses; if from allegory, it means for us our redemption done by Christ; if from the moral sense, it means to us the conversion of the soul from the struggle and misery of sin to the status of grace; if from the anagogical, it means the leave taking of the blessed soul from the slavery of this corruption to the freedom of eternal glory. Now that we have seen this, it is obvious that the subject around which the two senses turn must be twofold. And therefore it is to be determined about the subject of the whole work, taken only from a literal standpoint, is simply the status of the soul after death. The movement of the whole work turns from it and around it. If the work is taken allegorically, however, the subject is man, either gaining or losing merit through his freedom of will, subject to the justice of being rewarded or punished. . . . In order to understand, you need to know that comedy comes from komos, “village,” and oda, which means “song,” whence comedy sort of means “country song.” And comedy is a kind of poetic narration, different from all others. It differs, therefore, from the tragedy, in matter by the fact that tragedy in the beginning is admirable and quiet, in the end or final exit it is smelly and horrible; and it gets its name because of this from tragos, which means “goat,” and oda, sort of like “goat-song,” that is, smelly like a goat, as can be seen in Seneca’s tragedies. But comedy begins with harshness in some thing, whereas its matter ends in a good way. . . .